and we are completely OK with that. Our boys hailing from Charlotte, NC - Your Dirty Habit - have just released a new mix and have been gracious enough to let us have a copy of it (along with an exclusive track...shhhhh.. more on that later). Now this mix comes to us in a sort of family affair way. 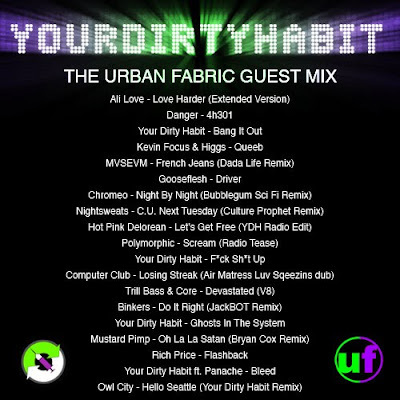 See, David and Eric (YDH) made this mix for our boy in Alabama, Urban Fabric, and his live radio show on 100.5FM in Birmingham. Now it seems that the powers that be at 100.5FM aren't too keen on their programing format any more and are switching over to talk radio (something we always need more of)... and this has all happened right before Your Dirty Habit's massive mix was slated to air. Lost and alone, we have been given this mix and have decided to raise it as our own, promote it here at PM. Very cool blog, thanks! Keep up the great work and have fun checking out one of my favorite electronica / world artists: Catya Maré...you won´t regret it!